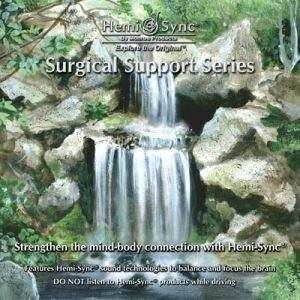 The Surgical Support Series was designed to ease the experience of illness, injury, surgery, chemotherapy, dental treatment and other physical trauma. By reinforcing the mind-body connection, these exercises help to strengthen the physical and mental components of the total healing process. The first three exercises Pre-Op, Intra and Recovery are for use before, during, and immediately after treatment. The last three exercises Recuperation, Energy Walk and Surf support healing and wellness. 6-CDs with Guidance manual. The target CD series with the Hemi-Sync® technology, designed as a support for medical procedures. Surgical procedures, pain management during illness and injury, dental treatment.